I’ve been a huge JD Robb fan for many years – I actually started reading her novels and it wasn’t until I had read 4 or 5 that I discovered that JD Robb is actually a pseudonym for the author Nora Roberts. These novels (which now number almost 40 in total!) are a combination of suspense, science fiction and a smattering of romance. Eve Dallas, the protagonist in these novels, is a Lieutenant living in a futurist world and solving crimes with the help of her Irish husband, Roarke, as well as a variety of colleagues and friends. I have literally read almost every book in this series, so I was pretty excited to read Indulgence in Death. In Indulgence in Death, Eve Dallas finds herself trying to solve a set of complex and perplexing murders. Though the murders seem to be connect together, the clues keep leading back to individuals who obviously could not have committed the crimes and have been framed. The murderer obviously has intimate details about all of the people being framed, including banking and other high-security information and has also obviously chosen the victims for a reason. Eve has to work with her team to figure out who is orchestrating these murders and why they are choosing to do so! In this case, Eve realizes, relatively quickly, who she believes are the suspects (yes….suspects in plural) but finding a way to prove their guilt is another matter entirely…. I really enjoyed Indulgence in Death! I loved the fact that Eve solves the murders but then has to find a way to actually catch the suspects. I’m impressed by the fact that Robb (Roberts) continues to be creative with the characters and that the plotlines continue to be interesting and engaging. On a personal level, I liked this book even more than some of the others in the series but I’m not interested in the romantic aspects of this series. I literally turn the page during the romance scenes so I can get to the plot, so I loved that fact that the romance element was kept to a minimum in this book! 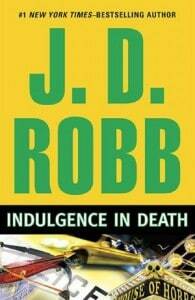 I’d highly recommend Indulgence in Death by JD Robb to anyone who enjoys a strong suspense novel! While there have been many other books in the series, this book can easily be read on its own! Reviews & Blogging 101 | What’s In A Good Pitch? Robb/Roberts amazes me with the wide variety of books she writes and the number. She has a B & B Inn located in PA. Rooms are named after famous couples. I believe there is an Eve and Roarke room. Have read many of her other books, but not the J. D. Robb series. I’ve heard many good things about them and as much as I like her other books, I’m sure these would be good too.